Yes, you can occasionally get good brunch in D.C. But I'm finally getting back into food writing. 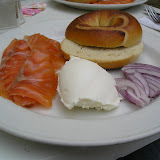 If you're in the New York area check out my new blog New York Food Journal. In addition to restaurant reviews, my brother and I are posting about recipes we like as well as the occasional rant. Thanks for reading! Unfortunately this will be my last post on Brunch DC. I am starting law school at Columbia next week so my ability to venture back South to D.C. will be limited. This site will remain up for as long as people continue to read it. All of my reviews can be found here. I've enjoyed exploring the D.C. brunch scene this past year. Hopefully it will continue to improve. I started this project with the premise that "Yes, you can occasionally get good brunch in D.C." and my initial premise has held true. Over my close to 40 reviews, the average rating was 2.2 stars out of 4. Only one restaurant got four stars -- Tabard Inn -- while six got only one star. However, ten restaurants got at least three stars. Thus, while D.C. still has a long way to go in perfecting my favorite meal, there are certainly bright spots, like the pides at Rosemary's Thyme, the bagel brunch at 2 Amys, the doughnuts at the Tabard Inn, and the fried chicken and waffles at Marvin. (1) Provide mandatory training on how to poach an egg. There were sundry occasions where my poached eggs were downright terrible. That ruins the dish, particularly the brunch staple Eggs Benedict. 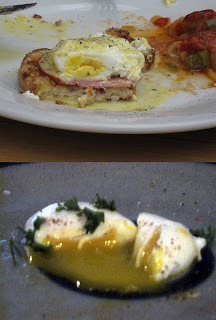 Note the difference between a horrible poached egg (at Stars Cafe -- unreviewed, just so bad), and an excellent one made by yours truly. The whites should be firm and the yolks runny. It's really not that hard. (2) Add some prix fixe brunch menus. One of my favorite places in New York, Essex, offers a brunch entree and 3 alcoholic beverages for a flat $18. It's an excellent deal. While prix fixe brunches have long been a staple in New York (even my local NY brunch spot, Fred's, offers an entree, coffee, and an alcoholic beverage for $15), you don't see them at all in D.C. And the $15+ bottomless mimosa deals that have recently sprung up don't count, it has to be all inclusive and under $20. (3) Get some decent Dim Sum or other ethnic food. It is a shame you cannot find decent ethnic food for brunch in D.C. Aside from the occassional Indian or Japanese buffet, there really aren't any ethnic brunch options in the city. An excellent and inexpensive dim sum establishment within the city limits would add a lot. (4) Improve the service. At even the best restaurants in D.C., the service was often slow, disorganized, and inefficient. I understand that the waiters may be just as hungover as the patrons on a Sunday morning but improvement shouldn't be too hard. We shouldn't have to be moved three times for our party of five at Ben's Next Door, or wait at least 20 minutes for someone to take our order at Utopia. Bad service really hampers the brunch experience at a lot of restaurants that have respectable food. Well, there you have it. For those who aren't sick of me, I may begin doing some food writing up in New York; if so I'll be sure to let my Brunch DC readers know. Farewell D.C.
Ba sed upon the recommendation of the venerable Mark Bittman, I headed to Cafe Atlantico for their Sunday Latin-influenced "Dim Sum" brunch. While certainly on the spendy side, Atlantico serves up inventive small dishes and excellent cocktails. Their small plates, or "dim sum", as they (for some reason) prefer to call them are great for sharing. To be sure, there's nothing dim sum about the brunch. No one's coming around with a dim sum cart. It's just a small plate brunch. But don't tell them that. In any event, the cantaloupe and tomato skewers with cilantro micro greens and vinaigrette was refreshingly summery, as were the fantastically thin pineapple shavings with plantain powder and tamarind oil. For more substantial dishes, the best ones were the jicama "ravioli" filled with guacamole, and the chili-tomato soup. Using thin jicama (a turnip-like Mexican root vegetable) as the ravioli skin creates a crunchy coating for the soft guacamole inside. The soup, served in a glass, was spicy and complex. It was served with a dallop of crème fraîche, which nicely cut the spiciness. Other interesting dishes were the mushrooms with a "63 degree" egg -- essentially a lightly poached egg -- and the quesadilla filled with wild mushrooms and huitlacoche (a corn fungus -- mmmm fungus!). The fried egg with verecruz sauce and the cauliflower-quinoa “cous-cous” were merely ordinary. The egg dish was simply a fried egg with tomatoes, mushrooms, spices, and tortilla chips. While all the ingredients were fine, the dish wasn't particularly creative or interesting. Similarly, the quinoa and cauliflower dish was well-cooked but was also fairly simple and uninspiring. For dessert, they make a "pan dulce" -- fluffy bread with mild melted cheese fried in butter and topped with maple syrup; needless to say it was sweet and delicious. Go for the tasting menu to sample more of these creations. This is a special occassion brunch since it's fairly expensive. Further, despite the price the service (like most D.C. restaurants during brunch) is inconsisdent. They should have changed our plates between dim sum "courses" especially after the particularly messy ones, but never did. They also should have explained what each dish was when it came out, especially the more creative ones, but instead the waiters simply dropped them off and sped away. Nonetheless, Atlantico is worth the splurge. Contact information after the jump. Continue reading. C ashion's Eat Place, while no longer affiliated with James Beard winning chef/owner Ann Cashion, makes a good case for being the best restaurant in Adams Morgan. The brunch features inventive New American dishes that are a few steps above the other restaurants in the area without being more expensive. The food along with its casually elegant setting make it a must-visit Adams Morgan brunch location. The best dish is their bison burger, which is topped with a perfect poached egg and is accompanied by a side of breakfast potatoes and béarnaise sauce. This dish is rightly considered one of the best burgers in the city, and perhaps the only one featured on a brunch menu. The buffalo meat is combined with fragrant herbs and comes out nice and juicy -- no small feat considering buffalo's penchant for being dry due to its leanness. The béarnaise is placed in a small saucer on the plate, which is ideal for dipping, but certainly takes away from the overall presentation of the dish. Another highlight is the pork hash with onions, scallions, cilantro, green chilies, and a poached egg. This was an inventive dish, as you don't normally see pork hash combined with cilantro and green chilies, but the dish worked well and had a nice kick. A light sauce could have made it even better since it's a little dry, and they overdo it with the gigantic dollop of sour cream. Their one omelet is filled with, spinach, grueyere, and mushrooms, and is topped with a tomato coulis. It's served unfolded, reminiscent of a thin frittata. The eggs are fluffy and the ingredients are fresh. It's a nice preparation but doesn't stand out above the other dishes. Cashion's also offers a rare commodity: a complementary bread basket, which is an excellent addition to the brunch experience. It was also important here because the service was unfortunately fairly slow, as we've come to expect here in D.C. Nonetheless, Cashion's inventive and delicious dishes rank it among the top Adams Morgan establishments. E veryone in D.C. is familiar with Ben's Chili Bowl, the U. St. landmark known primarily for its decent half-smokes, mediocre chili, long lines, and politician sightings. This past year Ben's opened up Next Door next door, an upscale bar and restaurant that serves generally delicious southern food in an attractive setting, but with bad service. The brunch menu features a small assortment of inventive interpretations on Southern brunch cuisine. The best dishes are the half-smoke benedict and (of course) the fried chicken and waffles. The benedict features two excellent poached eggs atop english muffins with an herb hollandaise. Next to the eggs are sliced half-smokes grilled to just barely charred (for those not familiar, they are half beef, half pork sausages). Fried chicken and waffles has become a staple in the D.C. brunch scene and Next Door's creation lives up to the standard set at Marvin and Creme. The chicken is perfectly crisp and spiced; though the waffles were fairly ordinary Belgian varieties. The maple syrup accompaniment was hot, which was a good touch. They also serve an decent but not spectacular omelet with half-smokes, chili, and cheese. The omelet provides another medium for their best seller at the original Ben's. While the food is generally well-prepared, all the dishes lack accompaniments -- no potatoes, salad, or fruit come with any of the dishes, which make the food look lonely on the plate. The main detriment to Next Door is that their service is both slow and disorganized. On my last visit, they had inordinate trouble seating my party of five despite a relatively empty restaurant (they ended up moving us twice), and the food took a really long time to come out. Hopefully they will work out those problems. It behooves the loyal Washingtonian to check out Eastern Market, which is finally reopened recently after the Fire of 2007 destroyed the landmark. Naturally there are sundry brunch locations in the area, including my favorite spot Montmartre. Montmartre is a charming French cafe named after the Montmartre neighborhood in Paris, a place formerly home to artists, philosophers, and musicians, and now mostly inhabited by overweight tourists attempting to scale the hill to visit the Sacré-Cœur basilica. The Parisian fare is generally excellent. In particular they make a luxurious buckwheat crepe which is served best filled with their salmon, cheese, dill, and fresh vegetables (there's also a prosciutto variety). The salmon is grilled not overcooked while the vegetables are fresh and crisp. Another highlight is their Croque Monsieur -- a grilled ham and gruyere sandwich with more cheese melted on top and served over a good dijon mustard. Montmartre could improve their drinks. I observed their bartender mixing their bloody mary with a store-bought (Tabasco brand) mix (Quelle horreur! ), their coffee was middling, and their orange juice was from concentrate and had too much ice. Nonetheless the quality of their food outweighs their beverage shortcomings. One point of confusion though: There are no photos of Montmartre in the place. How can you name your French restaurant "Montmartre" and not have any photos of it? A mystery. I have displayed a fondness for French restaurants here at Brunch DC, and Napoleon Bistro is no exception. Complete with waitresses with (possibly fake) French accents, a large menu of generally delicious French brunch dishes, and a charming French bistro atmosphere and decor (including an outdoor seating area), Napoleon is an excellent choice. The menu comes with a variety of omelets, crepes, salads, and other brunch entrees. They also have a large assortment of coffee-based beverages and the brunch-associated alcoholic choices like the bloody mary and the mimosa. While the food is good, whoever wrote the menu perhaps thought a little too much about their creations. The "Da Vinci" omelet of ham and cheese is labeled "A dream come true" while the Michelangelo omelet of salmon, scallions, and cream cheese, is modestly described as "A Masterpiece." For starters, they offer an interesting bread basket for $5. While this should be free, it does contain a pretty interesting and extensive assortment of breads with jam and butter. The walnut raisin and the Pain au levain (a sourdough French bread) were the highlights. The jam was not homemade, but was a decent variety. Ideally, this would be free, but I suppose $5 is not too much for very good bread. On the omelet side, the "Rembrandt" of brie, fresh parsley and sun dried tomatoes is a highlight. Even though it apparently does not warrant an over-the-top epthitet on the menu like some of the other omelets, it stands out nonetheless. The omelet itself is perfectly done without any imperfections or burn marks. The cheese is nice and creamy, and the vegetables are fresh. It also comes with a side of potatoes and a skewer of fresh fruit (an interesting presentation). The crepes are also good choices. Incidently, one of the better ones is far more an Italian dish than a French one -- the Florentine, consisting of roma tomatoes, ricotta cheese, pine nuts, and basil in a roasted garlic pesto sauce. The soft cheese complements the toasted pine nuts well. And they don't stiff you on the portion size either, as this dish comes with two side-by-side crepes. The other crepe highlight is the "Lisbon" which had smoked salmon, red onions, dill and cream cheese. This crepe was cut into four triangular pieces and was a very pleasant and refreshing dish -- much better than other crepe with salmon, the "Bolivar" (salmon, scrambled eggs, with a citrus-caper sour cream sause), which was too heavy. The wait staff was unfortunately fairly pushy, particularly with the bloody marys and mimosas. They also have (possibly fake?) French accents -- maybe I'm completely off-base here and if so I apologize -- but they sounded fake. The coffee, whose awesomeness was heavily touted on the menu, was merely mediocre and not hot enough. Other than these small imperfections, Napoleon Bistro is a solid choice. To suggest a place for Brunch DC to review or if you'd like to take me out to brunch, feel free to contact me at brunchdc [at] gmail [dot] com. Click here for a list of all of my reviews and features. Click below for all of the photos that are featured on Brunch DC.